Or so I was told before I moved here 10 years ago. I thought that was just hyperbolic state pride. I mean, really, not everything is bigger. New York has bigger buildings, Idaho has bigger potatoes, and California has bigger trees. What took me a while to realize is that this statement means Texans MAKE everything bigger. I say this on the last day of the 35th Annual Houston Ballet’s Nutcracker Market. I know every state and city has its own version of a holiday market, but you would be hard pressed to find anything on the scale of the Nutcracker Market. Just to give you an idea of its size, it is held in the Texan’s NRG Center. Yep, ladies, this is a football-size shopping venue made for professionals, not the casual or faint-of-heart shoppers. The building houses over 300 merchants and attracts more than 100,000 people over a four-day weekend in November. The primary attractions are holiday items: décor, clothing, sweets, and ornaments. However, you can find almost anything at the Nutcracker Market: jewelry, metal works, tunics, cowboy boots, pewter, pottery, rustic art, soup mixes, homemade candy, lamps, and even festive underwear. At the largest vendor, the Paul Michael Company, I could have purchased an entire dining room set and every thing you could possibly think of to go with it: linens, décor, dishes, candles, chandeliers, placemats, and food products. And, towards the back of the Paul Michael “booth” are warehouse-like displays of Christmas decorations and items to make Christmas crafts. Wreaths, garland, twinkle lights, sparkling mesh, Santa’s sleigh, bells, and a hundred different knick-knacks are stacked shoulder high in boxes and pallets. Vendors from Across the U.S. The Nutcracker Market features many local stores and craftsmen, and of course, those from towns all over Texas. Yet, there are vendors from all over the country peddling their wares (e.g., chocolate cherries from Michigan, dips from Kanas City, wine barrel accessories from Colorado, and Mexican vanilla from Utah). In fact, this year 116 vendors came from 33 different states, including Alaska. When I first moved here, my friends would talk about going to the Nutcracker Market as if this were a mandatory assignment for school. It wasn’t a question of whether or not I would go, but when, how, and with whom. 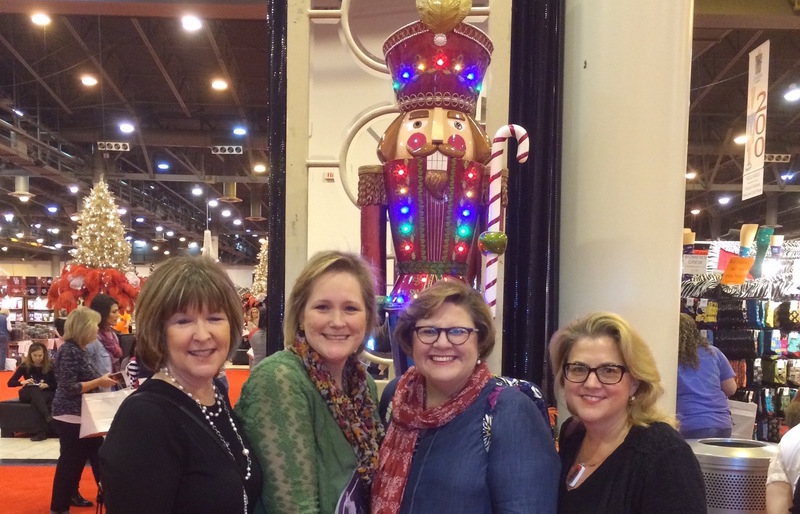 I quickly learned that attending the Nutcracker Market is akin to executing a girl’s weekend in one tightly packed day. Lest you think I exaggerate, my small group of friends and I left our Houston suburb at 8 AM so we could be assured a decent parking place by 9 AM. As we walked through the expansive parking lot, we noticed women tailgating. Yes, tailgating out the back of their SUVs. Mimosas, Bloody Marys, and breakfast tacos. I personally thought the idea was brilliant and quite apropos in the football stadium parking lot. Get there early. Have your breakfast. Put on your makeup, and hit the booths. Women dress up for this event—not in high heels and cocktail dresses, but in matching holiday t-shirts, couture Christmas bling, and silliness like reindeer headbands that flashed LED lights. I smiled at the cuteness of it all, but then when I lost my group for the fifth time in an hour, I saw the genius of all of us wearing a blinking Frosty hat just to be able to locate one another. It is easy to lose your BFF in this place. I bent over to price a burlap wreath, and my friend was lulled by the bling of a jewelry booth just across the way. She called me three times, and I only heard the third ring. Women in the throes of a shopping frenzy are loud. And what a frenzy it is! I saw women carrying larger-than-laundry-sized wicker baskets filled with ornaments, wreaths, angel statues, and lots of things that glittered. At the Under Wraps booth, people walked precariously to the checkout line with rolls upon rolls of holiday paper and stacked boxes and tulle. Several smart women brought along their husbands to do the heavy carrying. One hour after opening, I saw several men were leaving without their wives but laden down with large wrapped packages. Although the atmosphere was perfectly polite, I did see several women vying for the same tunics and leather purses. It was not unusual to see 40 people in line waiting to pay for their precious merchandise. The whole event reminded me of something in a Dr. Seuss book, a bit exaggerated, excessive, and colorful. Yes, the venue is just that big and that packed. I liken it to walking around in the Magic Kingdom on July 4, except in this scenario Mickey and Minnie would also have some food booths distributing free samples of toffee, dips, tamales, and BBQ and alcohol stations every 10 yards or so. And, there are no strollers in this magic land. There is just not enough room for rolling carts. You have to carry your own packages or check your packages in at a booth for a fee while you walk around. The check-package booth is just one of the moneymakers at the Nutcracker Market. Parking cost us $12, and the tickets were $18 (that was with a $2 discount for buying the ticket ahead of time). In sum, I paid $30 for the privilege to walk around and spend more money. And, there are pricier options as well. If you want to go to the Market more than one day, you can buy a four-day pass for $50, which also allows you early entrance on Thursday and Friday. Plus, the Wednesday Preview Night—a fancier affair with food, drinks and live entertainment—costs $250. This year, 4,000 people participated in Preview Night festivities. On Thursday, you can buy a ticket for the Saks Fifth Avenue Fashion Show and Luncheon (tickets start at $135), and on Friday you can attend the Macy’s Fashion Show and Brunch (tickets also starting at $135). It is no wonder that this one event raised $3.8 million for the Houston Ballet in 2012, and most monies came from the proceeds from admissions and 10 percent of the vendors’ sales. That’s BIG money, or should I say Texas-sized money. Because in this case, the Nutcracker Market is proof that some things really are bigger in Texas.